Its about letting children 'go' to do what they need to do, to learn and to grow. Your child is following their own deep play patterns coded into their body and developing brain, whether they are deeply engrossed in their own world or when interacting and playing with other children. This type of play is extremely beneficial. It is a requirement for developing human beings to unfold as designed. As adults and guardians of these young 'learning sponges', it is our job to follow their lead, to support them when required or requested, and to watch and wait as they discover, invent and explore. All children have their own built in 'readiness-meter', it keeps them safe – and feeling safe is paramount for optimum learning. Children suss out and sum up any new situation before engaging. With this in mind, please allow your child/children as much time as it takes for them to feel comfortable to engage in play. The two key senses for young children's learning are sight and touch - which includes movement and balance. Children are always noticing things they see, things that we adults are often oblivious to. Apart from the things they see around them, they are also constantly scanning for other information, they will be reading your eyes and your face to see if spiders are 'okay' or 'scary', if dirt is 'yucky' or 'okay'. Checking in with you, having eye contact is an important information tool for your little one. Your presence is the safe-ground that allows them to relax and feel safe. Every child wants to touch everything from the moment they have hand-eye coordination! Is it rough, smooth, wet, dry, prickly, warm, cold, hot, dusty, textured? Does it move or is it still? The most incredible amount of information is transmitted through touch! The finger tips are directly connected to the brain forming information highway. But there is a super-information highway, a place where you get even more information; touch combined with smell and taste. We have all done it, and we all see our babies doing it... into the mouth. The mouth has the most nerve endings of any part of the human body, giving a touch, smell and taste experience all at once. Add the sensory information coming through your finger tips as you put the 'treasure' to your mouth - information explosion! Have you ever known a baby or child to lay or sit still when they are not asleep? Movement and motion both stimulate the brain to grow. In the first two years of life a child's brain will grow from 25% of its adult size to 80% of its final size. Science has identified that movement is an important key to making this growth happen. More specifically, it is the rocking motion of walking that does it, the same motion they 'grew in' in the womb.4 So there is a good reason why children can't sit still and like to be rocked, they need it to grow, it is good for them. You are the Model: Your child 'downloads' you and the ways you interact in the world of Nature. Your children will be learning from what you do. When you come to Nature Play and enjoy the seasons and the weather, the trees and the plants, the creatures and the birds, the children and each other, you are teaching your children to enjoy Nature too: "It's just what you do". As you grow your love of the Earth, the children copy you and grow theirs. From you, they learn that the environment we are surrounded in is enjoyable and important. They learn that the worms, berries and birds around us are important parts of our Living Earth. Your child will decide when to leave your lap to explore. If they feel like climbing or finding acorns in the undergrowth, it is their curiosity that is driving their wonder and learning. You become a 'learning ally' when you understand your child needs to direct their own explorations. The exhilaration of discovery is something we can all identify with. 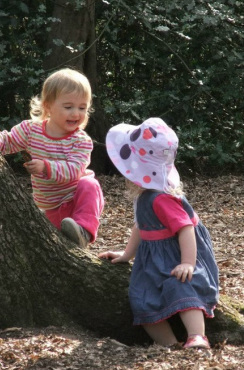 In order for children to discover climbing or what wet leaves smell like, a learning ally takes a step back to let them discover. At the same time a learning ally is there to support them if required or requested. Some things take time when you are learning, or when you are still perfecting the use of your body, so instead of jumping in to put a name the creature they have in their hand or to lift them up where they need to persevere with acquiring climbing skills, let's stand back. Let's watch and wait to be invited in to support. Your presence is the most important support. You are their 'safe-ground'. As long as they can see you, and as long as they know they can reconnect with you when they want to, they feel safe enough to play and learn. Time Flies When ﻿You ﻿Are Having Fun! None of us like to be interrupted when we are in the middle of something engrossing, so let's respect that our children might like to finish what they are doing. Children don't wear watches so we might have to warn them when it is nearly home-time, and we might need to listen for when it is home-time for them, then it is time to go. The Nature Play Guidelines are easy to follow, helpful guidelines that will help guide any adult wanting to support children at play. This double page document is designed so that you can it print off for easy reference.